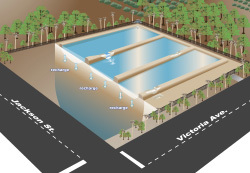 The Victoria Recharge Basin is under construction near the intersection of Victoria Avenue and Jackson Street in Riverside. When completed in the spring of 2019, the site will be used to replenish the groundwater aquifer with up to 1,800 acre-feet of water per year. That’s a yearly water supply for 3,600 homes. The project is a strategic part of Western’s plan to develop local, reliable water supplies for the region. Recharge basins capture stormwater from precipitation and runoff and then allow it to seep into the groundwater aquifer below. Recharge occurs naturally when rainfall collects and puddles on the ground. As it moves down through the soil from the surface, water fills the air spaces between soil particles and eventually replenishes or “recharges” the underground aquifer. The construction of a recharge basin is designed to mimic the natural hydrologic process. The Victoria Recharge Basin project is part of the larger Arlington Basin Sustainability Project that will eventually include additional production wells and a transmission pipeline. Upon completion, the project will stabilize the Arlington Groundwater Basin, improve groundwater quality and allow optimal operation of the Arlington Desalter, bringing additional local water to Western customers. Crews will be grading and preparing the project site for construction through September. Dust control measures, including operating a water truck four times per day during grading operations, will be in place. Construction vehicles and equipment may be staged along Jackson Street during construction because vehicles and machinery are too heavy to park on-site as excess weight on the project site will compact the soil and damage the recharge basin. Work hours: Monday through Friday, 7 a.m. to 5 p.m.
Construction noise from heavy equipment and power tools will occur during work hours. Both Victoria Avenue and Jackson Street will remain open during construction; however, there will be occasional street closures during movement of equipment and materials. Nearby residents and motorists will be notified in advance when construction activities may require temporary lane or street closures. Contact Lynne Butler at lbutler@wmwd.com, or call our construction hotline at 951.579.6197.